April 2, 2010 - Joining the likes of world renowned inventors Thomas Edison and Alexander Graham Bell, to name a few, Roger L. Easton is recognized by the National Inventors Hall of Fame for pioneering achievements in spacecraft tracking and timing and navigation technology (TIMATION) that led to the development of critical enabling technologies of the NAVSTAR-Global Positioning System (GPS). At the award ceremony hosted by Under Secretary of Commerce for Intellectual Property and Director of the United States Patent and Trademark Office, David Kappos, March 31, 2010, at the Department of Commerce Herbert C. Hoover Auditorium, Washington, D.C., Roger Easton received the NIHF Medal of Honor for TIMATION, U.S. Patent 3,789,409, the critical system enabling modern GPS. Beginning at NRL in 1943 as a research physicist, Easton worked on the development of radar beacons and blind landing systems at the Lab’s Radio Division. Early in his career, Easton collaborated with electrical engineer Milton Rosen to write NRL's Project Vanguard proposal for a scientific satellite program for the International Geophysical Year (IGY) — an unprecedented international effort to advance scientific studies of Earth that extended from July 1, 1957 through December 31, 1958. In March 1955, the Eisenhower Administration announced the selection of Vanguard and approved a plan to orbit a series of instrumented Earth satellites. 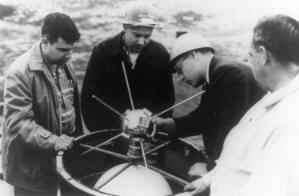 The Vanguard -1 satellite was launched into orbit on March 17, 1958. To provide a means for determining the space satellite’s orbit, Easton and his colleagues proposed, designed and built the first satellite tracking system. It was called MINITRACK, because it minimized the weight and power requirement of the satellite transmitter, which only needed to transmit a signal of a few milliwatts due to the very high sensitivity of the MINITRACK interferometer antenna design. Each MINITRACK station had two interferometer antennas at right angles, one north/south and the other east/west, with each measuring the direction cosine angle to the transmitting satellite as it passed through its “fan beam” antenna pattern. There were six such stations located approximately along the 75th meridian stretching along the east coast of the United States to the west coast of South America with one other station near San Diego, Calif. This network of stations, each making the two direction cosine measurements with the time of passage overhead of the tiny Vanguard satellite, provided sufficient data to determine the precise orbit of the satellite. When the Soviet Union launched Sputnik into orbit, the United States could not track non-radiating satellites or determine if other launches occurred. Easton solved this problem by extending MINITRACK to actively follow unknown satellites orbiting Earth. Under his leadership, with sponsorship through the Department of Defense Advanced Research Projects Agency, now referred to as DARPA, the Naval Space Surveillance System (NAVSPASUR) became the world's first system to detect and track all types of Earth-orbiting objects, thus contributing to America's national security and sense of well-being during the Cold War. “After seeing how well the very sensitive MINITRACK interferometer antenna field at Blossom Point, Md., detected and measured reflected 108 MHz radio frequency energy off the metallic shell of the Sputnik satellite, Roger quickly put together a proposal to build a new interferometer antenna system which, in a very short time frame, became the United States’ most capable system for what we today call ‘Space Situational Awareness’ or SSA,” said Wilhelm. NAVSPASUR stretched from the east coast of the U.S. to the west coast along a great circle path inclined at 32 degrees to the equator. It consisted of nine stations; three on the eastern complex of receiver-transmitter-receiver; three in the center of the U.S. and three more on the western complex. The data from all six receivers was brought together at a central processing station in Dahlgren, Md., where the orbits of all objects passing through the fence, above a certain minimum radar cross section, were able to be calculated and stored in a catalog. “As the number of objects in orbit grew it became apparent to Roger that adding a ‘second fence’ parallel to the main fence, with an offset of about 90 miles, a ‘one pass’ solution could be provided to determine the object’s orbit. Roger further improved the accuracy and utility of the data by adding ranging tones to the transmitted signal at the second fence. This however required that the receiving and transmitting sites, which were a number of miles apart, had to be set precisely on the same time base,” added Wilhelm. “Maintaining the accuracy required turned out to be difficult to accomplish and led Roger to the vision that the way to do this was put very good clocks, probably atomic clocks, in satellites,” he said. Easton conceived the idea of using satellite-carried precise atomic clocks for passive ranging. Starting in 1964, he conducted research, carried out space-based experiments, and published his findings that accurate, reliable and instantaneous satellite navigation could be achieved with passive ranging, circular orbits and a constellation of space-borne high-precision clocks synchronized to a master clock, the primary features of modern GPS. His work exploiting space-based systems for geodesy, navigation, and timing laid the foundations for his visionary leap to the concept he dubbed TIMATION, short for time-navigation. Sponsored by the Naval Air Systems Command, Easton tested his concepts at NRL through the development and launch of four experimental satellites: TIMATION I and II (in 1967 and 1969) and Navigation Technology Satellites (NTS) 1 and 2 (in 1974 and 1977). NTS-2, the first satellite to fly in the GPS 12-hour orbit and transmit GPS signals, flew the first cesium atomic frequency standard in space. Using time measurements from NTS-2, he experimentally verified Einstein's theory of relativity. A relativistic offset correction that he applied is still in use by every satellite in the GPS constellation. While initially designed for use by the military, GPS has been adapted for civilian use from commercial airline navigation to portable hand-held and wrist-worn devices. GPS today is a constellation of Earth-orbiting satellites providing precise navigation and timing data to military and civilian end-users around the globe. Easton, as a scientist and engineer at NRL, developed his concept for a time-based navigational system with passive ranging, circular orbits, and space-borne high precision clocks synchronized to a master clock. The U.S. Patent Office received his submittal, "Navigation System Using Satellites and Passive Ranging Techniques," and on January 29, 1974 it was assigned U.S. Patent 3,789,409. Easton, the former head of NRL's Space Applications Branch, Space Systems Division, retired from NRL and federal service in 1980, and later served as a consultant to NRL to conduct assessment of industry proposals for upgrading the Naval Space Surveillance System and to explore his concept for improving GPS geo-locational accuracy from 1994 to 2000. 1991 The Naval Space Surveillance Center established the Roger L. Easton Science and Engineering Award to mark the 30th anniversary of the Naval Space Surveillance System; National Aeronautic Association's 1992 Robert J. Collier Trophy presented to the GPS Team composed of NRL, USAF, Aerospace Corp., Rockwell International and IBM Federal Systems "for the most significant development for safe and efficient navigation and surveillance of air and spacecraft since the introduction of radio navigation 50 years ago" (1993). The Naval Research Laboratory established the Roger L. Easton Award for Engineering Excellence "in recognition of the multiple contributions in engineering excellence achieved at NRL by and under the leadership of Roger Easton" (1995); Induction by GPS Joint Program Office into GPS Hall of Fame "for his overwhelming contributions to engineering applications in navigation satellite technology [that] have made GPS a reality" (1996); and, The American Philosophical Society, Magellanic Premium for Navigation "for development of the Global Positioning System" (1997). Two years after leaving Federal service in 1980 and retiring to Canaan, New Hampshire, he was elected to two consecutive terms in the State Assembly, ran for Governor in 1986, and served three terms on the Board of the New Hampshire Electric Cooperative. In 2005 Easton was awarded the National Medal of Technology by President George W. Bush for his invention of the MINITRACK satellite tracking system used to determine the orbits of early Vanguard satellites; his development of the Naval Space Surveillance System which remains in use today cataloging all known man-made space objects orbiting Earth; the invention of a Navigation System Using Satellites and Passive Ranging Techniques and his subsequent development of Time Navigation and Navigation Technology Satellites that formed the technological basis for modern GPS. The National Inventors Hall of Fame honors the women and men responsible for the great technological advances that make human, social and economic progress possible. Each year, the Selection Committee of the National Inventors Hall of Fame Foundation selects inventors for induction from those nominated by peers and the public for contribution to the nation’s welfare and progress of science and useful arts. The Selection Committee includes representatives from leading national scientific and technical organizations. Prior to this year’s induction ceremony, 405 inventors have been inducted to the National Inventors Hall of Fame since its formation in 1973.